The class decided to perform an assembly for Year 5 and 6- teaching them all about orang-utans. The children had to do their own research and find out all about why orang-utans are endangered and the reasons for this. 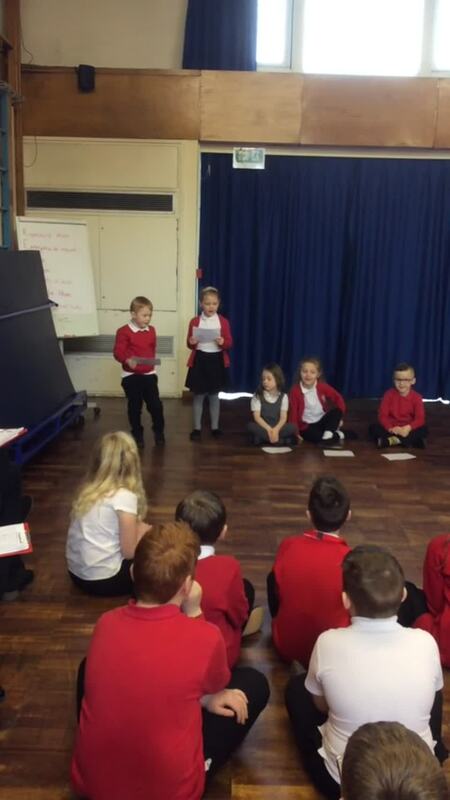 Each child in class was given a role or a section of the assembly to think about. They then had to write their own sentence about this topic using the information that they knew and make sure that it wasn't the same as anyone else's sentence. The class were fabulous and our extensive knowledge really impressed Years 5 and 6. Miss Lyndon-Hogg and Ms Taylor were shocked at how much the class knew. In Design Technology we have starting to think about making model with moving parts. Our introduction to this topic was making split-pin orang-utans. The children were so impressed with them and how their arms and legs could move. They had to cut out each part really carefully, pierce holes where needed and use split-pins to join the parts. The children really enjoyed planting beans this week as part of their Science work on plants. We look forward to watching them grow and observing what happens to them. In Maths this week we have been focusing on our number bonds to 20. We have been trying to represent them in different ways such as: with ten frames, Numicon, Part,Part Whole frames and as written calculations. We need to try and remember all of the pairs of numbers that add up to make 20. The children have been writing instructions this week and have written the instructions for how to make raita. The children then tested out their instructions by making their own raita. We even dipped some chapatti in it which we have been dying to try since reading the story; Chapatti Moon. We had a lot of fun in Maths this week using the Numicon, dipped in paint to print different amounts. The children were able to print different pieces of Numicon then add them together to find the total. It was very messy but very enjoyable. This half term we have been reading a book called the Jolly Postman.. The children have learnt all about writing letters and we thought it was a good idea to write letters to our families to let them know how we have been getting on in Year One. The children made plans or their letters and wrote draft letters from these plans. We edited them to make them better and then wrote up a final draft. Our favourite part of the process was licking the envelope! As a class we all walked down to the post box, carrying our letters. We were all very excited and enjoyed walking with our friends. We then posted the letters to our families. When the children came back to school, they were all excited to tell me about receiving their letters through the post and I sure they were just as excited at home!